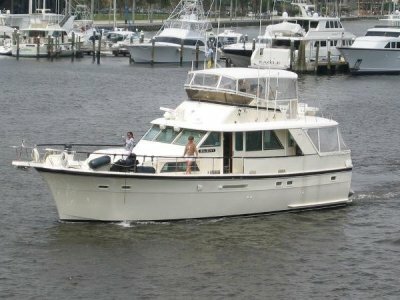 Current original owner purchased this boat new in 2011. 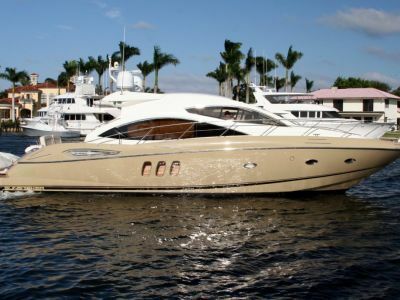 Built on a modified V-hull and solid fiberglass bottom, this twin- stateroom, two head floor plan offers the luxurious comforts of a small motor yacht. Owner has maintained this boat to the highest standards. An opaque sliding door next to the helm area, allows entry into the spacious and nicely appointed salon. The 12' Ultra-leather sectional seats 8 for cocktails and dinner. The salon also features a Panasonic Home Theater surround sound system, flat panel TV, air conditioning, heating system and a day head. The galley is port side, large, open and fully equipped. Galley includes a glass-encased built in liquor cabinet. The forward VIP stateroom has a center-line queen island bed with private access to the day head. 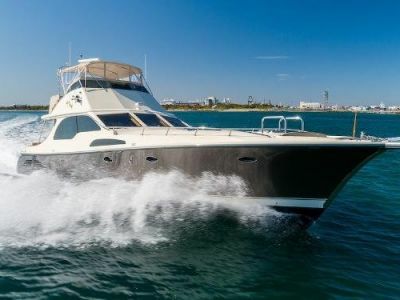 The full beam luxurious master stateroom located aft, features a queen island bed, plenty of storage, an entertainment center with surround sound system and an ensuite head with a separate stall shower. The fully air conditioned cockpit has a split level design. 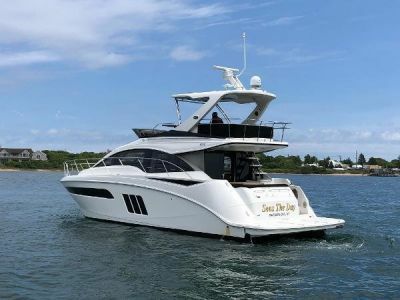 This upper operational level has twin helm chairs (Captain and Companion), guest lounge seating and a walk-thru windshield with a handrail for easy access to the fore deck. It is open, airy and has full 360 degree visibility. The lower level cockpit is designed for entertaining and relaxing with family and friends. Some of the appointments include a surround sound system, plenty of seating, a large cherry wood cocktail table, wet bar, refrigerator, ice maker and BBQ. There is dockside entry steps both port and starboard. Two transom gates allow access to the extended hydraulic swim platform. Other items worth mentioning are the hardtop, fiberglass integrated w/power sunroof and a transom "rumble seat". The steering system has the Fly-by-Wire & Joystick Technology (IPS) making it extremely easy to dock. The engine room has triple Volvo low hour engines with POD drives. The engine room is large and allows easy access around all three engines.